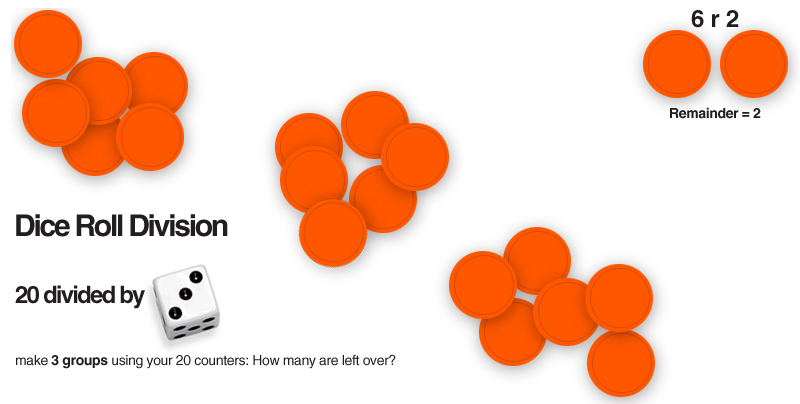 This fun division game comes from Learn-With-Math-Games! Kids get 20-50 counters (or other manipulative: dried beans, cheerios, etc.). They roll (1 or 2) dice and divide the number of counters they have by the number the dice lands on. For example, there are 20 counters and the child rolls a 3, he creates three groups using his 20 counters. Whatever is leftover is the remainder. The child keeps what is leftover (2 counters). On a sheet of paper, he writes down the answer: 6 with a remainder of 2 (6 r 2). He has 18 counters left to play with. Then, the next person goes. If a player rolls a numeral that is bigger than the number of tokens left to divide, he loses his turn (ex: player has 4 tokens left and rolls a 6). The player can't create 6 groups using 4 tokens. Visit Learn-With-Math-Games for full instructions and division printables!